Kitesurfing is THE BEST in the world and I would encourage everyone to have a go at it. It’s exhilaratingly great fun and a superb full-body workout. The sensation and feeling of pure freedom is indescribable when you become one with the elements. Almost daily I get the same questions from people who would like to try it out. Kiteboarding compared to windsurfing or surfing is considerably easy to learn. The learning curve is by far steeper, i.e. more fun in shorter time. b) ALWAYS respects the power of nature. I usually compare its danger level to scuba diving which is a safe sport as long as one does a course and progresses through experience from ‘open water-level’ to ‘advanced’ to ‘rescue diver’ and so on. If one would go to a shop and simply buy a scuba diving equipment and go diving, an accident is pretty much pre-programmed. 1) The dangers are not as visible as in surfing, i.e. nobody would paddle out into ‘Pipeline’ (Oahu’s North Shore) who doesn’t have the skill to do so, whereas in kitesurfing the power of the wind is not as obvious as the one of a monster-wave. 2) One is attached to the equipment and in some situations it’s a matter of a split second that one has to react in order to avoid an accident from happening. Experience is the main factor when it comes to that reaction. How can I avoid accidents? The most common example: 30 Knots, the kitesurfer only has 1 kite which is too big for that strength of wind, nevertheless decides to give it a go anyway with a ‘ah, I’m strong enough, I can hold my kite in those winds’-attitude… and ends up on a tree, in a wall, house etc. Thus once again: PLEASE TAKE A COURSE BEFORE YOU TRY ON YOUR OWN and ALWAYS RESPECT NATURE! Most accidents happen during the launch. PLEASE never rush launching your kite. Always double and triple check that your lines are correctly connected and brief the person helping you NOT to let go of the kite before you give the ’thumbs up-OK’. Do I need to be able to windsurf before learning to kite? Just like windsurfing, any boardsport (i.e. snowboarding, wakeboarding etc.) helps and so does any wind-related sport (such as paragliding) in speeding up the process of learning how to kitesurf. How do you learn how to kitesurf? Everyone wanting to learn should seek professional advice. There’s uncountable kiteschools and teachers worldwide and a basic course usually lasts about 8-10 hours (i.e. 2-3 days). First of all there’s some theory that has to be explained, starting of with ‘the wind window’ (the invisible area in the air) that’s used in order to dictate the kite how to perform. The understanding of the wind window and skill to control the kite in that area 100% is the vital basis for kitesurfing. You will experiment and learn this with the help of a ‘trainer kite’ (often also referred to as ‘stunt kite’), a smaller version of the ‘real thing’, usually about 1-3m2. A trainer kite is the perfect tool to learn e v e r y t h i n g (launching, landing, generating power, flying the kite with only one hand etc.) that you will need later in the water, in the SAFEST way possible. With the trainer kite you can actually make mistakes that won’t hurt you and will spare yourself, others around and your equipment of sustaining damage. The water relaunch is vital and requires a bit of practice as well as an understanding of the wind, possible currents in the water, and kite-control. Before you cannot master the bodydrag upwind and the water relaunch there’s absolutely no reason for attempting to go into the water with a board!!! Please take your time in training yourself in the 3 points mentioned above and you will be a safe & happy kiter! Last but not least the board will be added. Please note: the more you will have trained yourself in kite-control, body drag upwind, and water relaunch the easier it will be to add the last part in the ‘learning-how-to-kite-puzzle’. Please NEVER use a board leash! It is totally unnecessary plus a serious danger to yourself (for the ones who are not aware of this: board leashes do extend in length under pressure, thus imagine being dragged through the water, the board on a leash on your leg, resisting the water the leash will extend and when you come to an halt, snap…often right into ones face or neck. Even if you wear a helmet a board leash can cause serious injury as your neck and your face isn’t protected), however, a helmet in learning is always recommended. Which kitecentre, school, organisation is the best? IKO (International Kitesurf organization, check out www.iko.org) and VDWS (Verband deutscher Windsurfing und Wassersportschulen) are the leading instructional organizations. You should chose an accredited kitesurf centre for your basic course and make sure that the equipment is rather up to date, in good condition and ideally a recent model of a main brand such as North kiteboarding. Many schools today teach on bow kites as it makes life easier for the teacher. Personally, though, I would recommend to start your basic course with a school that teaches with hybrid or C-kites. After the course if you feel for it, have a go on a bow kite and decide for yourself what ‘feeling’ you prefer. You should keep in mind that the transformation from C- or hybrid-instructed to bow is much easier than the other way around! What board/kite equipment is good to start of with – choosing the right equipment? Today’s kitesurfing-equipment is almost incomparable to only 3 years ago and recent technical advances in performance and safety do certainly assist in learning. Kite manufacturers have put a lot of efforts into the development of preference- and skills-specific lines of kites – there’s bow, hybrid, and C-kites, intermediate- and high performance kites, wave- freestyle- and so many more… – and kitesurfers today have a wide choice of different brands, models, and of course sizes. Yes, the range of kites in the market can be confusing and the decision which one to get, especially if it’s the first kite, often almost veeery tricky. Pretty much the same with boards. Also budget is a factor and if I was you, I would go for a ‘last season used but in good shape kite without any repairs’ perhaps similar to the ones that you learned with. One thing that I would like to highlight here again is: more and more schools teach with bow-kites as it’s very safe and a bit less complex, however, that’s exactly also the problem solely with bow-education: you o n l y know bow and eventually you might want to change to a C-shape or hybrid … and you will have to re-learn. With regards to boards, for the beginning, the size will be the determinant factor for choosing your first ‘baby’ and that will depend on ‘your size’ (as in weight) and also skills in other boardsports. For example for a male kite-beginner, of about 80kg, who’s pretty good in snowboarding/wakeboarding, I would recommend some freestyle board, around 135- (max) 140 x 38 cm. Please note, additional width will make up a bit for length, however, will also make it harder to learn to ride toeside or to hold the edge in chop. To come to a conclusion, try to decide your aims and what kind of kitesurfing you want to progress into. Do you want to ride in the waves or on snow or is freestyle your cup-a-tea etc. Then do some research and compare different brands, read reviews, check into quality and warranty and most importantly try to figure out the wind conditions you’re most likely to go kitesurfing in. 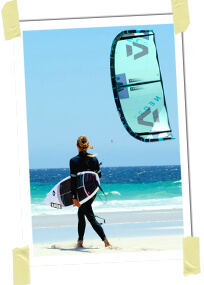 North kiteboarding is at the forefront of all brands and has a huge selection of beginners- as well as advanced kites. Check out www.northkites.com for their extensive range and details on all their products. The same accounts for Fanatic, one of the most established brands in board design, check out www.fanatic.com . How fit do I have to be in order to learn kitesurfing? Do I need a lot of upper body strength? Is it rather a sport for men than women? NO, absolute bullsh*%§t ! Kitesurfing doesn’t require any super-powers; it’s all about technique rather than strength. Kitesurfing is a sport for everyone, the fun factor is huge and in fact women are often a bit faster in learning the kite-control than men. A recent student of mine was 65 years of age and my youngest 11. With regards to kids, I would not recommend teaching anyone below 10 years of age as basic, logical safety-comprehension (such as f.ex. : what a kite line can do when rapping around ones limb etc.) hasn’t fully developed yet. What’s the safest wind-direction to learn in? The safest wind directions to kite are cross-shore and cross-on-shore. Avoid off-shore and cross-off-shore because they can generate dangerous and stormy winds that will prevent you from returning to shore in case of a problem. To ride with onshore wind, you must know how to ride upwind. If you ride in different spots, you will meet different wind conditions, so it’s always best to consult with the local riders before riding.